With profit rates steadily declining, more and more capital is abandoning the “real” economy – the one that produces goods and services and which creates new value through the exploitation of labour power – in order to chase the mirage of easy profits offered by speculation. An attempt, in other words, to somehow replace the profits capitalism lost in the productive sector with speculative gains. This capital flight has only helped to depress “real” production and magnify a parasitic mechanism that began with the financialisation of the crisis itself. This process involved the growth of fictitious capital, or easy credit, given the low cost of borrowing. As a result the US economy was flooded by an ocean of debt – from the State, to companies and even families. When the Federal Reserve increased interest rates the bubble burst with the global consequences we have all seen. The explosion not only hit the financial apparatus – the banks which had to be saved at any cost (too big to fail) – it also impacted heavily on the fragile productive fabric which had originally generated it, bringing lower wage rates and worse conditions of exploitation for the international proletariat. On the other hand, the use of Quantitative Easing to staunch the financial haemorrhage means that a gift of over $12tn was given to the banks alone (beyond Stiglitz’ $20tn mentioned above). The millions of jobs that Trump waves like a flag, as evidence of the alleged economic recovery, have actually materialised in the shape of some hundreds of thousands of jobs, but with ultra-precarious contracts, sometimes even for one week, underpaid without any health or trade union coverage. Meanwhile, “the debt economy” progressively expands to a worrying degree. In one year, from 2016 to 2017, the debt of non-financial corporations (companies) grew by 11.1%, the public debt increased by 6.7%, household debt grew 12.5% and the financial sector debt grew by 11.3%. The great recession of 2007-8 and the subsequent long depression which still continues, have weakened the overall economic framework. The global capitalist economy remains stagnant, with a low rate of productivity growth. Trade flows are slowing down and, above all, the profitability of productive capital has not improved. Meanwhile cooperation has been replaced by increasingly cruel competition (see Trump’s tariff policy). According to World Bank economists’ projections, world economic growth is expected to fall to 2.9% by 2020 and, therefore, the long depression that began in 2008 not only has not ended but will continue with its dangerous toll of trade wars, economic wars and increasingly violent and widespread wars of plunder. In the USA, the public debt that in 2007 was about $9tn (75% of GDP) had reached $19.2tn by 2016, 105% of GDP.3 In recent years, under Trump, this has only increased and in future it will be even worse. With the acceleration of Trump’s policies, it may already have reached 130%. According to the Treasury, the budget deficit for 2018 has risen by 17% and is the highest since 2012. Revenue increased by 0.4% while expenses exceeded 3.2%. The Congressional Budget Office projection for 2019 is that the budget deficit will reach a trillion dollars ($1tn, or one thousand billion). Trump’s policies anticipate extraordinary outlays, including $700bn for defence, 31% tax cuts for businesses (against, it must be said, an increase in private taxation of 6.1%). In all the Federal deficit will increase by an additional $214bn “thanks” to these tax cuts and increased military spending which will also increase the interest that has to be paid on the debt. In the meantime, the federal debt has skyrocketed to $22tn compared with about $18tn in revenue. The budgets of more than half of the states in the United States have to be supported by the deficit policy of the US federal government. In addition, student debt has reached $1.5tn; credit card debt equals $1.6tn; $1.22tn for cars and $11.8tn of corporate debts. On top of these there is a huge, but unspecified, amount of debt incurred through the purchase of real estate, as well as another unspecified amount for the total debt of the individual states. The most worrying figure, however, is company debt. If it is true that in the first quarter of 2018, the top 500 US companies achieved a 26% increase in earnings per share, it is also true that this was exclusively due to the enormous tax reduction proposed and implemented by the Trump administration (30%). If the profits of the entire corporate sector had been calculated without the tax cuts, then in the first quarter of 2018 there would have been not a gain but a fall of -0.6%, immediately preceded by an initial decline in the fourth quarter of 2017 of -0.1%. With the tax reductions, profits have increased by 6%. Meanwhile, however, profitability is low. The average profitability of plants in America and the G7 economies remains well below pre-crisis levels, even after ten years of alleged recovery and despite the powerful capital injections of the Federal Reserve as well as the other central banks of the major industrialised countries. The real obstacle to overcoming the crisis is the low rate of valorisation of capital. The fear now is that the next crisis, widely predicted by the same American analysts, will occur from the explosive combination of manufacturing companies’ debt in the US as well as in all G7 economies, and the overall mass of debts. This is especially true for large companies, while small and medium ones do not even have this option, unless they are ready to run the big risk of going bust. So they remain at the mercy of a market which is likely to eliminate them. This is the same pattern of financialisation of the crisis which preceded the bursting of the “sub-prime” bubble. Much of the debt is rated BBB, bonds with the lowest investment grade. This means they are just a hair above junk. Their fate is linked to even a minimum increase in interest rates which increases the cost of servicing the debt and therefore increases the costs of production. The number of BBB-rated companies has increased by 50% since 2009 and does not seem to stop. The real situation of the American economy that has “exited” the crisis is to be found in Government debt, the federal deficit, the balance of payments deficit, and the debts of half of all the American states. On top of all this public debt there is the pile of private and business debt. This mountain of debt and deficits would make the US economy the most precarious in the world were it not for the hegemonic role of the dollar and the strength of its army, ready to intervene in the four corners of the world whenever there is the slightest risk of interference with its strategic aims and financial interests. But as Roberts says in The Long Depression, “the big risk is the combination of declining profitability and increasingly high debt in the corporate sector, not just the American, but across the G7. If profits continue to slide, while the cost of servicing debt increases with the rise in interest rates, then this would be a dangerous recipe for a chain of corporate bankruptcies and a new, devastating debt crisis. Global debt, in particular corporate debt, is at historic highs”. We would add that the fuse is lit, so when is it going to explode? Even at the periphery of capitalism, in the so-called emerging countries, the situation is replicated. Most manufacturing and financial companies in the “emerging” countries have heavily borrowed in dollars, since interest rates on the dollar, then (before the crisis), and now are relatively low. The Federal Reserve Bank has deliberately kept the interest rate on the “greenback” at almost nil. Much of the enormous flow of capital that has moved into emerging economies was not intended for productive investment but has been directed towards loans and bonds for speculative activities. Meanwhile, long-term capital flows towards emerging economies for productive investments (FDIs) have been in rapid decline for at least a decade, or since the beginning of the “sub-prime” crisis. The consequences are apparent: every country affected by the financial crisis has raised interest rates on their government bonds. In Turkey, the interest rate that the State must pay to public sector underwriters has gone up from 12% to 20%, in Argentina from 6% to 26.2%, in Russia from 4% to 8%, in Indonesia from 3% to 9%, in Brazil from 10% to 267% in Lebanon from 20% to 281%, in South Africa from 12% to 112% (i.e. three out of five BRICS). It’s like a movie we’ve seen before, a horror movie full of economic and social devastation. When the god Profit loses its supreme role in the production of surplus value, it makes capital run away from productive investment towards speculation, towards the creation of a massive amount of fictitious capital. Debt now “governs” the US economy. All the fundamental data of the American economic system are in the red. Debt is suffocating productive activity, including enterprises themselves, threatening their survival on the domestic market, and obliging them to mimic the large concentrations of speculative capital in the hope of surviving the decline in profit rates. It is to protect companies such as these – the ones overwhelmed by debt and devoid of profitable investment opportunities (half of which have a BBB rating, just above junk) – that Trump’s short-term thinking brought him to raise tariffs against half the world, in particular China. He didn’t stop to consider how China, with its very low cost goods, has so far allowed the over 80 million Americans living below the poverty line to feed themselves. Nor did he take on board the inevitable reaction from those parts of the world which are now facing a wall of customs duties against their more competitive goods. 1) In the wake of Russia’s rescue of Assad’s regime in Syria, to prevent it having a permanent base in the Mediterranean. 2) Detach Europe from its energy dependence on Moscow by building a series of pipelines to replace existing and planned Russian ones. 3) Obstruct every opportunity for Moscow to commercialise its Siberian “energy treasures” by stepping up its trade in roubles, given the threat of replacing the dollar that is coming from China and Maduro’s Venezuela. On top of these scenarios, which are already so tense that they are on the edge of “direct confrontation”, the US has imposed duties against Iran and North Korea, against Venezuela and Canada, and now threatens increased taxes on trade with Germany and Italy. In the case of Venezuela, Trump’s trade policy has two objectives: the first is to destabilise the Maduro government which is already badly hit by the devastating economic crisis throughout the country, at the same time as politically favouring and funding the right-wing opposition. The second, as already mentioned, consists in preventing Maduro from selling oil with a new crypto-currency (the petro) that would replace the dollar, at least in the Latin American region. The US policy of imposing import duties dates back to August 1971 when America first experienced a trade deficit of $2.5m (today it is $556bn). The USA, which had literally flooded the world with its goods after the Second World War, less than thirty years later found itself a net importer of goods and services. The deficit itself was not high, but it revealed the reduced competitiveness of American goods and signalled a dangerous turn-round in relations with Europe (Germany) and Japan. The announcement on de-linking the dollar from gold had a twofold impact. On the one hand, the declining gold reserves in American coffers were unable to match the enormous mass of dollars circulating on the international market, a mass that is constantly expanding. On the other hand, with the dollar devalued and released from the gold standard, those who lost money were the speculators, the savers and all the international banks which previously had invested in the dollar as a safe asset. Nevertheless, successive US administrations have made sure they continue to make the dollar – even if unhooked from gold – the universal currency of world trade, the refuge of last resort par excellence, a commodity whose wholesale cost is close to zero, a monetary instrument for all speculations, and the means by which enormous flows of capital are channelled to the US economy. But a strong dollar inevitably penalises the competitiveness of American goods by opening up a trade deficit chasm as the years go by. Still, the various Administrations have done everything to strengthen the dollar, even while trying to offset the commercial damage. The priority has been to keep the dollar’s dominant position in the international money markets so that rivers of financial capital could be drawn into the American economy to finance the various deficits, while what remained could be exported as capital to invest in countries where the cost of labour power was far below that of the American proletariat. This key role for the dollar is so important that ever since the oil crises of the early Seventies successive US administrations have not hesitated to engineer wars, both to get their hands on energy raw materials, and to ensure that oil and gas producers do not dare to deal with anything other than the dollar. Today, so-called oil (or pipeline) wars, and the “perennial” issue of the supremacy of the dollar, are still as significant as in the Seventies, only their geographical framework has changed and widened in intensity and ferocity. The Trump administration seems to be trying to square the circle, i.e. to continue to have a strong dollar and a balance of payments which, if not in positive territory, at least is an acceptable deficit. The policy of tariffs, in addition to its political value of imperialist opposition with sworn enemies and commercial opponents, is precisely a reflection of this “have your cake and eat it” policy – i.e. a strong dollar and balance of payments which does not reflect the constant undercutting of what is produced in the States. In short, specific national tariffs and occasionally wars generated by economic crises – beyond the fact that they destroy capital values which need to be rebuilt – are capitalism’s daily bread. Coupled with armed force, they achieve the economic and strategic objectives which diplomacy and “normal” competition are unable to accomplish. This is how wars, which have never stopped since 1945, reflect the growing tension between the US and the other imperialist powers. Today competition is increasing on all fronts – manufacturing and industrial, commercial, monetary, and strategic – and is turning into open military confrontation. The motor force is still the economic/financial crisis. The crisis of profitability, which brings lower returns on manufacturing investment, generates more and more speculation. This in its turn has generated an immense mound of financial liabilities which bring the additional danger that an increase in US interest rates will spark an irreparable debt crisis and provoke another, much worse, world crisis than the one which the optimists define as already a thing of the past. A nominal and real rise in 10 year yields on US Treasury Securities (3.25% and 1%, respectively over the highs of 2011) was enough to create ructions on New York financial markets on October 10, 2018. The combined fears of a further increase in Treasury yields and the risk of a trade war with China caused the Dow Jones to drop 832 points and the S&P500 to lose 95 points (-3.29%) by the close of the day. This was the worst fall since February 8th when the Dow dropped over 1000 points. This contraction of the markets and the sell-off that hit securities in the technology sector (Nasdaq) were also connected to the import duties imposed on China. But the most powerful detonator was the fear that higher interest rates will magnify the indebtedness of entire productive sectors, including technology ones. Securities of Facebook, Twitter and Netflix lost 20% of their value in an instant. Even Trump has blamed what he called the “mad” Fed policy of a third consecutive interest rate rise so far in 2018. All this is an undeniable sign of a permanent crisis for capital which appears on the surface in the shape of financial collapses and, more fundamentally, in the now endemic lack of returns in the world of the real economy. It is the latter which is driving capital to flee investment in favour of the ‘useless’, albeit riskier, road of speculation. Here then is the only way capital can try to get out of the economic and financial crisis in the short term: competitive devaluations, speculation, import duties, more intense exploitation of the workforce, dismantling of the welfare state. In the long run, however, only a substantial destruction of capital values can resolve the crisis in the profitability of capital. It is no accident that in the Second World War it was the productive sectors which were most devastated. Afterwards this allowed US imperialism to invest productively in renewed infrastructures and reconstruction of European industrial plants located mainly in Italy, France, Germany and even Japan. Moreover, the US was able to export its surplus financial capital to key economic sectors of the defeated countries. Thus, a huge opening was created for both the victors and defeated to begin a new cycle of accumulation. But the end of the Second World War did not bring an end to the fury of imperialism, either American or Russian. In their different strategic ways, they continued to confront each other. Not because the second world tragedy had not caused enough destruction, but because, in addition to destroying in order to rebuild, imperialism needs to export capital, to invest abroad, to control and exploit territories with important raw materials and, last but not least, to exploit energy resources and manage their trade routes and get a share, possibly in monopolistic terms, of the revenues. In the aftermath of the Second World War, a long series of proxy “cold” wars was to begin between the two victorious power houses of imperialism. Amongst them was the conflict in China in the period 1937-48 where a Chinese Communist Party siding with the Russians faced a pro-American Kuomintang. The outcome after 1949 was that China was divided into two parts, the continental one, which fell under the influence of Russia, and the island of Taiwan which came into the US orbit. Only a year later the conflict moved to Korea (1950-53). The Vietnam war followed (1962-75) and the bellicose events that bloodied Central America, in Honduras and in Nicaragua, for and against the Sandinistas. As usual, on one side was Russian imperialism defending its “new colonies”, on the other the US which used the services of the Panamanian narco-trafficker Noriega to defeat the Sandinistas. (The latter character, who took tons of drugs from Colombian Cartels into the United States, even returned loaded with arms supplied by the CIA to be distributed to the Contras in Central America.) We could continue showing how the clash between the USSR and the USA defined the nationalist quarrel between Israel and the Palestinians, the missile crisis in Cuba, the Panama affair and US marines landing etc. Suffice it to say, all of these represented conflicts in an endless war interrupted, not by peaceful solutions, but only when one of the contenders was obliged to abandon it. Then the USSR imploded. An implosion which was the outcome of decreasing competitiveness, of a disproportionate increase in investment in capital goods whilst labour productivity either declined or remained stagnant, thus bringing a change in the organic composition of capital and an inexorable fall in profit rates. Despite their low productivity and profitability, the huge investments in constant capital that were made largely benefited the powerful State oligarchy, which derived its “five-year” bribe from the financial allocations to industry and agriculture. The more the state invested in constant capital, even if it was not very productive, the more the Russian oligarchy had the chance to divert a portion of capital into their own pockets. Once again, the US played its part in promoting the economic crisis of the Soviet system by focussing on the competition between the two for military technological innovations and the arms race. The USSR was forced to borrow heavily to pay for armaments. USSR defence spending accounted for 23% of GDP, against the 7-8% of its GDP that the US was spending. This enormous disparity led to a disproportionate deficit in the coffers of the Russian state which opened up the first breaches in the Soviet state capitalist economic system – a system already undermined by the scourge of a steadily falling rate of profit, and growing weakness at the periphery of its empire. It was the experience of Solidarność in Poland – thanks in part to the CIA and Vatican – that would annul the “fleeting” experience of a fake socialism that had come out of the defeat of the October Revolution (the first and only historical example of proletarian revolution to have occurred as yet). The collapse of the USSR was effectively followed by 10 years of US mono-imperialism which gave successive Administrations free rein on the international scene. It was the era of the “first” oil wars, where the US extended its control over associated aspects of the industry, such as the construction of pipe lines, storage centres and refineries. These obviously had to get into the hands of the American oil companies and other specialised companies linked to oil, including engineering and logistic issues, all of them participating in the exploitation of the oil revenue itself. This was the period when American imperialism came out in the open: in the 1990-91 war in Iraq, in Afghanistan and then the second war in Iraq in 2003. A whole decade was interspersed with “minor” but strategically important wars, like those in the Sahel in Africa and the one that destroyed Yugoslavia, the last European bulwark of fake socialism in Titoist guise. Meanwhile, post-Soviet Russia, thanks to Siberian oil and gas fields, regained a position in the ranks of international imperialism and repositioned itself, with China, as a counterpart to the American superpower, giving rise to a de facto second cold war. At this point (2011) after the explosion of the “Arab Spring” the conflict moved to Syria and Libya. In Syria, Russia is supporting Bashar el’Assad in order to defends its interests in the Mediterranean, with the maintenance of the military and commercial ports of Tartus and Latakia . The alliance with Assad’s Syrian Armed Forces, provides Russia a bulwark in the Middle East against Saudi Arabia, Israel and their US imperialist mentor. Here there is already a generalised war taking place before our eyes, a war orchestrated by all the most powerful imperialist centres in the area. On the field we find Russia and the US with their corresponding allies. Alongside Russia is Iran, Iraq, and the Lebanese Hezbollah. This is the Shiite axis of the Middle East. Lining up alongside the US are Saudi Arabia, the Emirates, Qatar9, which constitute the Sunni axis – loyal but not so much – to Trump’s ambitions. Machinations are taking place inside Libya where France, Italy, the UK and the USA are all manoeuvring. France and the UK, backed by omnipresent US imperialism, were behind the military expedition against Gaddafi. Here the double aim was to take away ENI’s (Italian state oil company) control of 40% of Libyan oil (France’s goal) and prevent Gaddafi from selling its oil in euros, roubles or yuan. In Syria we have seen the massive presence of all the major culprits for the carnage. With their diverse, often conflicting interests, new alliances have been formed and old ones dissolved, in a series of episodes that have brought the ruin of an entire country with two million dead and over four million refugees. Turkey, Russia, Iran and the Shiite axis on one side. The US, Israel and the Sunni axis on the other. Each has its own interests to defend, whilst in the middle the various Kurdish nationalisms have become the military instrument of one imperialism and thus the target of attack for others, even though they are part of the same coalition. Given the number of powers involved, their areas of influence, their active engagement in the war, we can only conclude that we are already in the midst of a “bizarre” world war where, apart from a few exceptions, notably China, the major imperialist antagonists are already colliding in one of the world’s most important strategic zones. It is no figment of the imagination to think that the next financial crash, driven by increased interest rates, will lead to an even worse economic situation worldwide and bring with it the danger of more generalised war through an intensification of current wars or the outbreak of new ones. 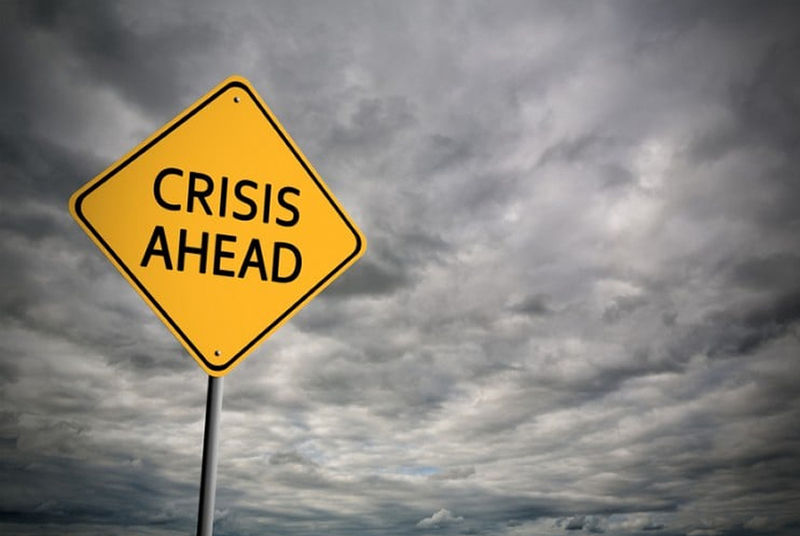 From a political perspective, beyond the need to analyse what is going on in the world, it must be firmly stated that the crisis is not an accident, an inevitable natural disaster or some sort of divine curse. It is the product of the existing mode of production, of a global capitalism which is in a deep economic crisis from which it cannot escape; which is generating a mountain of financial ‘paper wealth’ 12-14 times the world gross domestic product10; which is fleeing from production to devote itself to the palliative of speculation because profit margins in the real economy are no longer sufficient for productive investments. In short, it is the fall in the rate of profit which accelerates capitalist competition and the clash between imperialisms. In this context the tendency to war is not a warning, but the concrete reality of all international relations and a state of affairs which involves all the main imperialist powers of the planet in various places in the world. It is a situation that can only be resolved by going to the heart of the contradiction that underlies the entire capitalist edifice, that is, the relationship between capital and labour. In no way can the problem be solved in terms of redistribution, as the more or less radical reformists always suppose, but only by building a position of strength in the struggle between classes and therefore of political leadership in the form of the class political party. Such a party will call for a break in the contradiction of capitalism itself in order to lay the political and economic foundations for the construction of a new society, a society that is no longer based on the labour capital ratio, not aimed at maximising profit, without the wars that create destruction in order to rebuild, without the existence of classes which presuppose the economic and political dominance of one over the other. In other words, a society of associated producers who work and build for collective needs, where everyone contributes according to their particular skills and abilities. Otherwise it will still be barbarism, destruction and death for millions of proletarians; victims, first of exploitation, then of the war that must recreate the conditions for the production of profit itself. There is no other solution. Either the world proletariat will succeed in escaping from the cages of nationalism, from the thousand triggers for war that imperialism sets every day, or a bursting of one of the many speculative bubbles – possibly stemming from the Federal Reserve putting up interest rates – will be enough to intensify and generalise the tragedy of existing wars and turn the world into a gigantic cemetery. Either war, with its heavy burden of death, destruction and barbarism, or the revolution where the proletariat takes on the task of giving life to a new equitable, communal and human social frame. But for this to happen a strong international party is required to remove wage workers from the dominant thought of the ruling class, stuffed as it is with provincialism, nationalism, racism: as if these trappings of bourgeois ideology were, in any case, the pole star for the whole humanity. It is vital to undermine and demolish the dominant ideology of the ruling class, to begin to pose the question of a class-to-class frontal clash, to present an alternative to this system which can only exploit, produce crises, devastate the eco-system, bring disastrous wars which only herald worse imperialist conflicts that will allow for the destruction of enough capital value to rebuild, to create the conditions for a new cycle of accumulation. This in turn would inevitably have the same problems as before, but with an even greater capacity to destroy the world along with a proletariat unable to find the strength to prevent yet another barbarism. For our part, we are doing everything we can to stop this from ever happening. The “dualism” of war or revolution is not an invention of the god Mars or the rebellious Prometheus in chains. There is no historical course that necessarily leads to war or revolution. The world will go towards war or revolution, not because history is already written in the Great Book, but only as the result of the balance of power between the ruling class and the subordinate class. And this is not written anywhere except in the consciousness of those who work in one direction or another. There are no historical courses leading to one side or the other. The only valid yardstick is to evaluate the balance of power between the classes, the economic underpinning that conditions their existence, the ideologies which dominate them, and the signals that come from one class or the other. If we were to venture a hypothesis today, on the basis of current elements, we should say that the war “solution” is the most probable. This is because in the current state of affairs the balance of power is on the side of the various imperialist bourgeoisies. Each of them attacks their proletariat by means of greater exploitation, by punishing job contracts, by increasing relative and absolute poverty. They make and break the most absurd governments by supporting them or letting them fall according to their own contingent interests. Abroad, that is, outside of their economic market, under the pressure of the crisis, they set up theatres of war, mostly fought by proletarians in the area under contention. It does not matter whether the proletarians are Kurds or Arabs, Shiites or Sunnis. The important thing is that they are being dragged into the ideological mechanisms of this or that imperialism and that they act as cannon fodder for the sole benefit of the interests of the imperialism that has ideologically subjugated them. As regards the proletariat, the opposite is true. They rarely oppose the economic attacks and the increasingly humiliating conditions of life that their respective bourgeoisies force upon them. We live in a period when the crisis is so deep that the margins for successful demands which once characterised the daily struggle are narrowed. Today workers struggle not so much for a wage increase, but for the most elementary social rights, such as housing and better conditions of life and improved services. When workers take to demonstrating in the streets, they do so to defend themselves from the attacks of the bourgeoisie. They do so to keep their jobs, to stop their factory being displaced by some other service or from being moved abroad, where another army of desperate people is ready to be exploited under worse conditions. This is the picture, the snapshot that makes us say that the current balance of power between the classes inclines us to consider the possibility of an even worse war in terms of intensity of destruction and the involvement of the international proletarian masses. But things do not always go as the snapshot of the moment suggests. Over a longer time frame, it is not the instant picture but an ongoing movie that could change the story. In other words, the balance of power between the classes can change during the course of events. Let us not forget the October revolution which had the strength to express itself in the middle of the First World War. Then too there was a world economic crisis, the various European proletariats were under the banners of their respective imperialisms, nationalism was raging worldwide, yet the Russian proletariat raised its head, opposed the carnage of war, fought for the revolution against the barbarism of imperialism behind and with its party, its tactics and its communist strategy. Then came isolation from other revolutionary experiences in Europe and the enormous economic retreat encouraged the forces of the counter-revolution, even within the Bolshevik party itself. So the revolutionaries do not simply have the task of analysing how things are going, whether by a pre-determined destiny or by a whim of the gods, but of studying the economic and social situation as the capitalist crisis unfurled. Revolutionary communists have the task of creating the subjective conditions for the revolution, not in opposition to the balance of power between the classes, but in harmony with any sudden, unexpected changes in those same power relations which could signal a change of direction. Amongst the subjective goals that revolutionaries must aim for is the building of the international communist party without which any change of course in the relationship between classes, any resumption of the class struggle would end up with no day-to-day tactic or strategy for achieving an alternative to capitalism. The proletariat would still be stuck ploughing the same tragic capitalist furrow, that generator of all crises and wars. Here too the October revolution taught us a great lesson. Without the Bolshevik party, tens of millions of peasants and millions of workers would have turned away from any revolutionary solution and would have been re-absorbed into the mystical nationalistic climate. What followed is part of another aspect of history that we could call “revolution and counter-revolution”. Today we are faced with “war or revolution”, learning the lessons from the past which led to the victory of the Russian proletariat and identifying the adverse conditions and consequent errors that accelerated its defeat. 6. For more on the increasingly intense rivalry between the US and China, see ‘US Power and the New Course Towards War’ in Revolutionary Perspectives 12 [ 2018]. 8. And just to increase that advantage by a further 10% the price of an ounce of gold was decreed equivalent to $44.2 in February 1973. 9. Qatar, in pursuit of its own imperialist interests in Egypt and elsewhere, fell foul of the Saudi Sunni godfathers who organised sanctions against it in 2017 and it has since also exited OPEC. Turkish troops are now stationed there against possible Saudi aggression – a threat which seems to have diminished with the latest invitation of the Qataris to attend a summit in Riyadh. 10. According to the Bank for International Settlements (BIS), in 2013 global financial activity generated $993tn, compared to the estimated $75tn value of global GDP. “… of this $993tn only $283tn can be classified as ‘primary’ finance such as shares, bank credit, etc. The remaining $710tn are derivative products, exchanged outside of the regular markets with only a very small fraction of these transactions having any link to the real economy.” Report by Marco Panara, ‘Finanza, un trilione di dollari che soffoca l’economia reale’ in La Repubblica, 27 October, 2014.